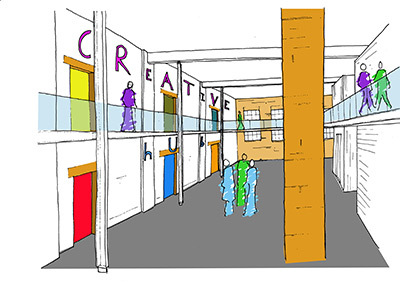 Resort Studios successfully bid and won the opportunity to establish and manage a creative workhub in the heart of Margate, further extending their existing artist studios to include provision of co-working spaces and studios for creative individuals and micro businesses. Designs for utilising the empty spaces within Resort Studios are already underway with refurbishment works set to complete in February. This is an exciting moment for Resort Studios who are looking forward to welcoming more members and creating invaluable national and international creative networks. We have Permanent Desk and Hot Desk Spaces options available from the beginning of March. Please take a look at our membership options. This opportunity has been provided by Recreate, part of the Interreg Programme with support from Kent County Council and Margate Arts Creativity Heritage.